SharePoint Client Browser 1.0 released, bye bye preview! Finally after 2 months I decided to build the 1.0 version of SharePoint Client Browser and released it to the community! Although the preview (beta) status did not prevent people from downloading it. The counter is currently set at 555 downloads since start of the project on the 2nd of July (only 2 months ago). CodePlex project and download at https://spcb.codeplex.com/. So what got changed? I guess almost everything changed from authentication support for default (username and password), SharePoint Online, anonymous and forms based all the way to almost complete coverage of the Client Side Object Model (CSOM). That’s a bit over the top, but the basics for Foundation are in the tool. New capabilities for future releases will focus on Server components like taxonomy. A hidden gem is the PowerShell support. 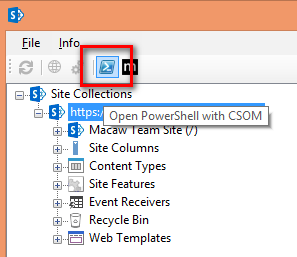 It’s very easy to start a PowerShell session and use CSOM within PowerShell. Meaning remote PowerShell for SharePoint Online (and on-premise of course). Dat is nog eens handig. Gelijk maar even proberen! This looks great! I will try this tomorrow first thing. This looks like a GREAT tool, I’m looking forward to trying it out! Very handy tool that developers and admins can add to their toolbag. Similar to the SharePoint Manager 2010/2013 tool that has been a great resource for many years now. 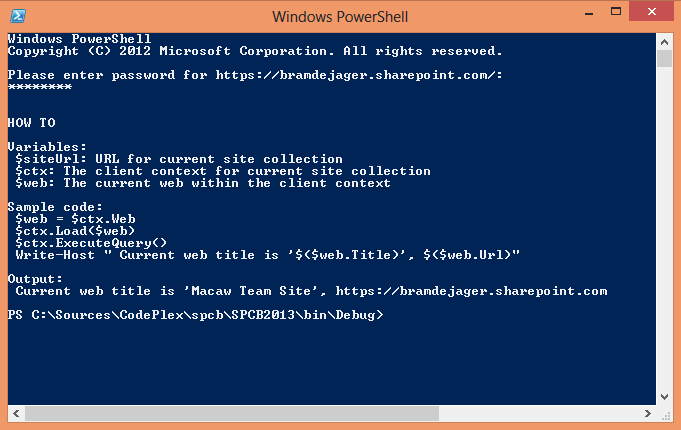 SharePoint Client Browser has the added benefit of supporting different credentials modes, remote SharePoint Sites and handy PowerShell integration.